You wake up a little later today and head to the bathroom only to see two big red bloodshot eyes staring back at you in the mirror. Maybe you didn't sleep well, maybe it's hay fever season, maybe you one too many margaritas at the bar last night and woke up in someone else's bed (lucky you)...either way you can't leave the house looking like this, so you reach for the eye drops. But did you know that the drops could actually be making the redness worse? That's right, although it may provide you with some immediate relief, those drops can be causing you more harm than good. Do you use eye drops regularly only to find that a few hours later your eyes are red again, sometimes even worse than when you first used them, and you need to use them again, and again and find yourself in a vicious cycle? Do you use eye drops everyday and find when you don't use them people say that you are looking tired? There is a reason for this, and it has to do with the affects the chemicals have on the blood vessels in your eyes. The chemicals used in eye drops are known as vasoconstrictors, meaning they constrict or tighten the blood vessels in your eyes. You see when your eyes become red, they are just blood vessels that have expanded to increase the flow of blood to the area. This can be a result of numerous things such as hayfever, infection, pollutants, rubbing your eyes etc, and is a natural response by your body to these things. When you put drops into your eyes, the chemicals constrict these vessels and the redness seemingly disappears. But there is a problem. You see blood vessels can dilate and constrict themselves, but when you introduce chemicals to constrict them, such as the chemicals in eye drops, and the chemicals wear off, the blood vessels dilate again, sometimes more than what they were at originally. Meaning more blood in the blood vessels, and therefore more redness in your eyes. This is what's known in the medical community as "the rebound effect" or rebound hyperemia to be exact. 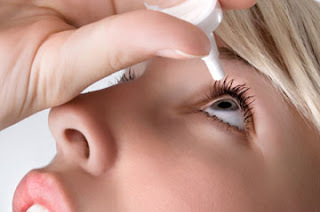 What's even worse is that if you are using eye drop on a regular basis, the blood vessels in your eyes loose the ability to constrict themselves effectively and your eyes are constantly red. Your eyes are basically addicted to the drops. If you only use eye drops occasionally, after a big night for example, they are fine in moderation and you shouldn't encounter this problem. If you are using them regularly, even every day or a few times a day, then you may be well aware that you already suffer from this. The best option? To go cold turkey and stop using the eye drops altogether. It may take a few days, to a couple of weeks for your eyes to recover, depending on your use and dependence on the drops, and you may just have to put up with red eyes until then...or release your inner Olsen Twin and hide behind some oversized glasses. If you find your eyes are red in the mornings, a natural way to remedy this is to keep some cold compresses, or two spoons, in your refrigerator and place them over your eyes in the morning. The cold will help naturally constrict the blood vessels and you should see some relief. If you see redness in your eyes, it could be a result of a larger problem and you should always consult your doctor.